If your organization is struggling with how to develop an innovation strategy, know that you aren’t alone. Leaders in most organizations typically agree that innovation is a good idea, so they set innovation as a key organizational strategy and then neglect to define what it means within the context of their organization. As a result, everyone is left knowing innovation is important and that they’re supposed to do it, but wondering exactly what they’re supposed to be doing and how. Without clarity on what they need to do differently, people can’t mobilize in a cohesive way to create the value and results the innovation strategy is meant to produce. In short, when thinking about how to develop an innovation strategy, they’re missing the detailed thinking that transforms innovation from something we want to see into something we do. The first step in developing an innovation strategy is actually to take a step back and ensure everyone is on the same page with what innovation means within the context of the organization. Innovation isn’t a one-size fits all proposition – it needs to be outcome-driven and approached in a way that’s relevant to organizational needs and capacity. What are some examples of past innovations in our organization? What are our strengths with regards to innovation? Our weaknesses? Who in our organization should innovate? What are our key priorities for innovation? As we delve into these questions, appreciate past efforts and challenge assumptions about the potential for more innovation, we’re able to get a sense of where the organization is now with regards to innovation. We can also better understand the leadership team’s appetite for further efforts to achieve and sustain innovation. This is important because innovation doesn’t happen through wishful thinking. We often tell leaders – you can’t delegate innovation, you have to lead it. What Does Innovation Look Like Here? Once innovation has been defined by the leadership team, they are ready to articulate a shared vision of innovation that is specific to their organization. This step is key: leaders must be able to articulate the vision to their teams so that everyone understands where the organization is headed, and they must be able to share the vision in a way that helps teams understand what’s expected of them and where the organization is headed. Based on this shared vision, we then work with leaders to develop a framework for the innovation strategy, which they are now able to do with more clarity and commitment. As part of this step, we examine any obstacles that stand in the way of implementing an innovation strategy, such as tools and skills that teams may need to acquire to support innovation. Think of the innovation strategy workshop as the preparation that needs to be done before taking a long journey—the planning and packing if you will. After the workshop, leaders have a definition for innovation in their organizational context and a vision they can share in a meaningful way. In other words, they know where they want to go. They have a framework that identifies their priorities—what they want to achieve on this innovation journey and what they need to get there. They are now ready to address the innovation strategy itself, which is the detailed roadmap of how to achieve innovation in the organization. If your organization is trying to articulate an innovation strategy and vision that all your leaders and their teams can work towards implementing, your organization could benefit from an innovation strategy workshop. Our innovation strategy workshop takes one day. It’s a small investment that produces big benefits: clarity around why innovation is important to your organization, what you want to achieve with innovation, and a framework that outlines how you’re going to get there. After the workshop, you receive a detailed report on the workshop results and a summary of your next steps. Bottom line: within two weeks, your organization has a roadmap for innovation and the vision and tools needed to develop a more detailed innovation strategy. 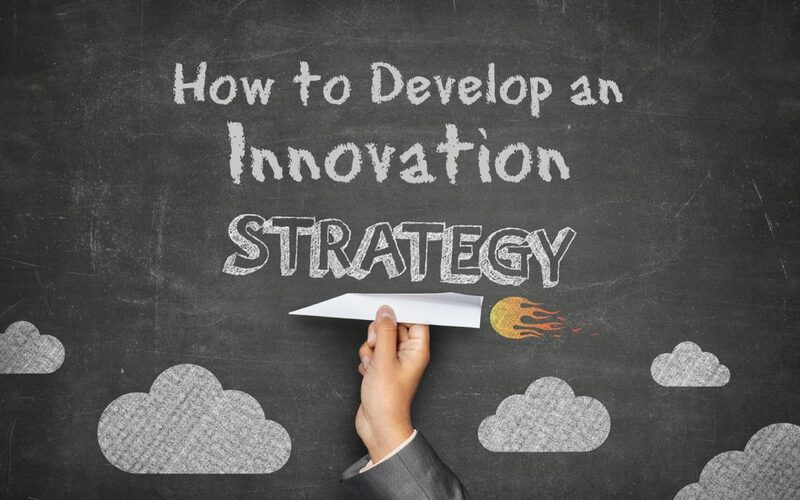 To discuss how to develop an innovation strategy in your organization, contact us for a free consultation.